The pool was closed but they offered to let us use another hotel’s pool. Front desk. Employees like Helen- very courteous and pleasing and explained how expenses are charged in detail. Even showed us where to have late affordable and good lunch. Kat- cleaned our room completely and gave us coffee, clean towels and changed bedsheets. Was not too crazy about bathroom and kitchen. Both need ventilation blowers and hallway carpet was so out dated and not look clean. Nice hotel. Grear location. Clean room. Great breakfast! room was clean however, after a LONG check in process, we were given a key to a room that was already occupied. We walked in on strangers! It was very poorly handled. The manager apologized, but it should never have happened. Convenient hotel, close to everything you need. All of the staff were very polite and helpful. The staff was amazing! So friendly and even called up to our room a few hours after check-in to make sure our room was up to our standards. We arrived prior to check-in time , and even though they couldn’t let us check in yet since our room wasn’t ready, they had no problem loading up our luggage on a luggage cart and storing it for us. Same treatment was received when we were checking out. The minor downfall was that the ice machine nor the water machine in the fitness center worked. However, I would still Definitely recommend this place to anyone who isn’t willing to break the bank but still wants to stay in the city close to shops and restaurants. Thank you so much Waikiki Gateway Hotel! The hotel is amazing, loved it. A bit splurge but well worth walking through if you next to it. Close distance to waikiki beach, but cheaper than hotels at waikiki. The staff and service at this hotel are very good. We were impressed with receiving a newspaper everyday we stayed with even a box of marshmallow rabbits on Easter Sunday morning. The building is old and is in need of some repairs, but overall it is a great location close to everything you'll need. Overall great experience. Reasonable price but there are additional fees: - $25 fee for the amenities! - Parking is another $25/day! Took a little stay-cation here from the windward side of Oahu for 3 days 2 nights. The staff was very helpful and welcoming! Room was very nice and open with 2 balconies and breakfast was even better! Photos on here match the exact room spot on. If your looking for a nice place to stay for a few days with low rates then THIS IS YOUR ONE! Hotel is very out of date and needs a big update. In my room there was A LOT of mildew and discoloration on the ceiling in the bathroom. There was also a permanent smell in the room I could not get rid of...something between urine, bleach, and drainage pipe. The balconies offer a great city view. I had a partial sliver of ocean view which was nice. Hotel staff was accommodating. Spend your money and stay somewhere else. This hotel is old and over priced for what you get. Great place to stay, very close to everything, the views from the rooms are amazing, the staff and house keeping is very tentative, and very pleasant and quick to help with guests needs. I can't decide between 2 stars or 3 stars for this hotel. This is the second time I stayed at this hotel during Christmas. For the price I paid this year and thinking the remodeling should be done, I expect better room but did not get one. I got a smaller one with no desk but with microwave this time. The bathroom remodeling is only half done leaving the old bathtub. This year resort fee is up from $10 to $20. So we took the breakfast for hotel guests offer. The breakfast is ok at the discount price but I would never pay full regular price for it. Swimming pool is small and fitness center smells stuffy so can't work out there. Business center with 4 or 5 old PCs in a very nice room on 3rd or 4th floor is gone this year leaving only two new PC at the lobby. I like the location and room size very much, but kids are complaining about the facilities. So have to find another hotel next year. 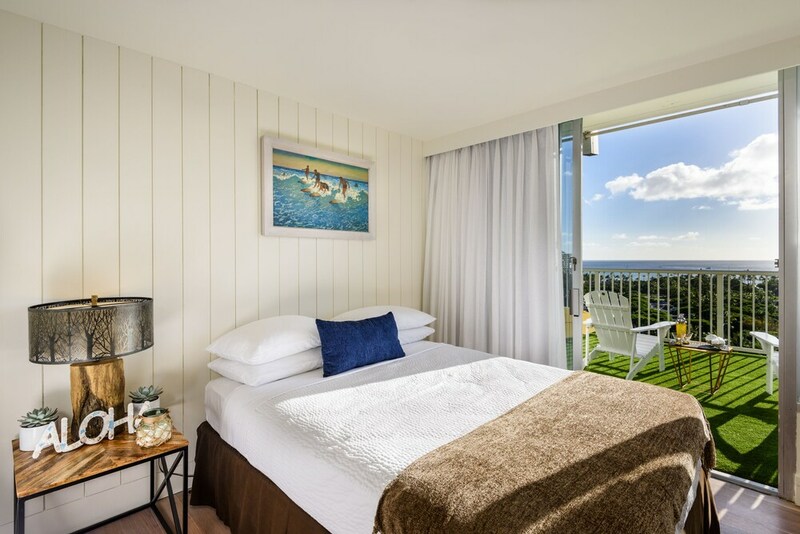 Located in Waikiki, Hotel LaCroix Waikiki is adjacent to Waikiki Beach Walk and within a 10-minute walk of other popular attractions like Royal Hawaiian Center. This 188-room, 3-star hotel welcomes guests with conveniences like free in-room WiFi, a fitness center, and a business center. For your convenience, a buffet breakfast is served for a fee each morning from 6:30 AM to 9:30 AM. Guests can expect to find free WiFi and 55-inch an LED TV with cable channels. The bathroom offers hair dryers and free toiletries. Other standard amenities include a refrigerator, free newspapers, and free local calls. At Hotel LaCroix Waikiki, guests have access to a fitness center, free WiFi in public areas, and a meeting room. Valet parking is offered for USD 29.00 per night. Multilingual staff at the 24-hour front desk can assist with tours or tickets, luggage storage, and dry cleaning/laundry. Additional amenities include a business center, a computer station, and free newspapers. Aloha Anonymous, thank you for taking the time to write a review and sharing your feedback. Please accept our sincere apologies for failing to meet your expectations during your stay with us. We hope you will consider staying with us again in the near future! Mahalo Nui Loa! Love and Aloha Anonymous, thank you for choosing to stay with us and we appreciate that you took the time to provide us with your valuable feedback. Mahalo for your kind comments about Helen and Kat. We are very blessed to have them as part of our team. Please accept our sincere apologies for the issues you encountered in your room. We are continuing the process of improving our hotel. Providing an exceptional guest experience is our number one priority and we greatly value your feedback. We hope to host you again in the near future! Mahalo Nui Loa! Aloha Anonymous, thank you for taking the time to write a review about your stay with us. We strive to fill each guest's experience with Love & Aloha. Our unbeatable location and wonderful breakfast are one of the best in Waikiki. We are happy to hear you enjoyed your stay with us. We look forward to hosting you again in the near future! With Love & Aloha. Aloha Anonymous, thank you for taking the time to write a review about your stay with us. We are happy to hear you enjoyed your stay with us. We look forward to hosting you again in the near future! With Love & Aloha. Aloha Anonymous, Thank you for sharing your feedback with us. I will be sure to share your feedback with the rest of the management team. When you're planning your next visit to the islands, we hope you'll choose to stay with us again and give us another chance. Aloha Anonymous, Thank you for taking the time to review your stay with us. I am very pleased to hear that you like our clean room but I deeply apologized for sending you in an occupied room. We are going to addressed this for the rest of our team. Take care! Aloha Catherine, thank you for taking the time to share your feedback with us. We're very happy to hear that you enjoyed your time with us and liked our convenient location, wonderful breakfast and great service from our friendly staff members. We strive to fill each guest's experience with Love & Aloha. Mahalo again for staying with us. We look forward to welcoming you back for another wonderful stay in the near future! With Love & Aloha. Aloha Anonymous, Thank you for taking the time to share your experience at our hotel. I am so happy to hear your wonderful comments about our incredible staff. We strive to fill each guest's experience with Love & Aloha. We are always making improvements and the best is yet to come. We can't wait to see you again. Recreation features at Hotel LaCroix Waikiki include a fitness center.